and hikes across the tundra and up incredible mountain sides. 3 hotel nights in Whitehorse. 2 person tents during the canoe trip ( double occupancy, single occupancy upon request), all activities according to the itinerary, 2 flights by floatplane, to and from the river, all required shuttles, canoes with spraydecks, complete cooking and camp gear, all meals during the canoe trip, experienced licensed guide, satellite phone for your safety. Transportation to and from Whitehorse, alcoholic beverages, meals during hotel stay. Ability to paddle in fast moving water with obstructions ( WW class 2). We consider the Wind River more demanding than the Big Salmon River. Hiking requires good footing and fitness. There are no trails, and steep and slippery sections are common. There is one short portage (200 m) to the river. After that, some lining might be required, depending on water levels. Hard to say, what makes the Wind River so special. 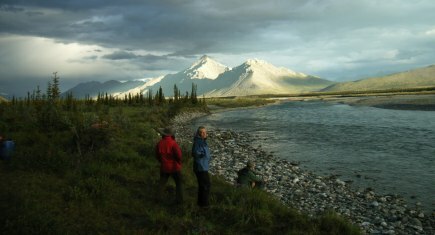 Is it the canoeing, the mountain hikes, wildlife viewing, incredible campsites ? Or is it the dramatic sunsets on the mountains ? No, its the combination of all that. 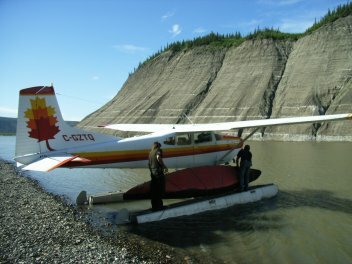 The Wind, only accessible by floatplane, starts in the Wernecke Mountains, and drains through the Peel and Mackenzie River eventually into the arctic ocean. Being close to the arctic circle, it never gets dark in the summer. That allows for ample time to explore. In the beginning of the trip, the tundra starts at the river's edge. This allows for easy access to the rugged mountains. Huge alluvial fans lead us away from the water and up the steep slopes. On the first part of the trip, while we are in the mountains, we have shorter paddling days which allows more time for exploration on foot. On layover days we follow small streams up the valleys to canyons and waterfalls, or hike up mountain ridges to reach spectacular viewpoints over the vast Wind River valley and beyond. The crystal clear water of the Wind River maintains a good pace all the way down to the confluence with the Peel River. Often, the Wind braids substantially into many channels, that makes route finding interesting. With appropriate paddling skills, it's fun to switch channels and maneuver through turbulent water. Some tight corners, enlivened with sweepers add spice to it. The Peel River is impressive with steep canyon walls, almost all the way down to the pick up point. In the Lower Peel Canyon the river becomes extremely narrow and the sedimentary rock formations are one of the highlights of the trip. On a small river nearby we oil rusty canoeing skills and learn new tricks. In the morning we pick you up at the hotel and have a whole day to play on the swift clear waters of a mountain river. Negotiating some rocks in the current, eddy turns and other helpful maneuvers give us a feel for the canoe in moving water. With the empty canoe, you can feel out your boundaries and those of the canoe. This is a great introduction to prepare for the Wind River but also a very scenic river trip. At the end of the day we will drop you off at the hotel. On the approach we will see the upper reaches of the Wind and the creek we will follow to begin our journey. In no time, canoes and gear are lying on the lakeshore, and the plane has left. In peace and quiet we set up our first wilderness camp. The small mountain lake invites us for a leisure evening paddle. 200 km of Wind River are ahead of us. At the beginning, the Wind River is quite small and shallow. There are some tight corners with sweepers to navigate, and the current is fast. The valley becomes wide and open, allowing for distant views. Dall sheep, caribou and grizzly bears are quite common in this area. Because of the low vegetation it is easy to spot them in the distance. Around Bond Creek and Bear River we have extra time to relax in the midst of those colorful mountains. Before the river leaves the mountains past Royal Creek, we take another day off to go on a ridge hike above the Wind. The river picks up more speed as it races towards the Peel. We navigate through a maze of river braids and shallows. Some turbulences and choppy sections make this part very enjoyable. Just before the Little Wind joins in, some standing waves present a class 2 rapid. Mount Deception , an island peak above the tundra of the Peel River Plateau, is our last chance for a day hike. From up top, we see all the way to the Richardson Mountains and down the network of channels from the previous day's journey to the end of the next paddling day. On gravel bars we find coal deposits, washed out of the riverbank. Just before we reach the Peel River, the wide gravel bed of the river changes into a narrow colorful canyon. The Wind stays spectacular to the very last meter. Each bend asks for a photo stop before we finally set up camp at the confluence within the canyon section. A gravel bar on the Peel River will be our last Camp on the river. From here we will be picked up by the floatplane. Yes, on this trip we will fly twice. With the tundra and parts of the wind river valley below, we will enjoy a spectacular overview of the area we discovered over the last couple of weeks. Back in Mayo we will start our journey back to Whitehorse by Van. Our last night will be in the hotel in Whitehorse again.